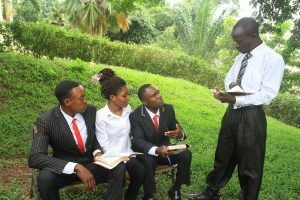 From its inception, End Time Harvest Bible College has raised men and women into flaming arrows which are released into this dry and parched world, spreading revival everywhere they go. ETHBC has awarded 755 diplomas and degrees to flaming arrows who are serving the Lord throughout the nation of Ghana and abroad. Our graduates are serving the Lord in various capacities, from founding ministries, serving as Senior Pastors, Associate Pastors, Branch Pastors, as well as serving their churches as lay-pastors and various leaders heading or serving the different departments of their local church. Some of our graduates are serving the Lord in Nigeria, Cote’ d’Ivoire, South Africa, Botswana, Tanzania, India, South Korea, the United Kingdom, Germany, Italy, Jamaica, Russia, and the United States. Subscribe, unsubscribe, or change your contact information here. Complete if you are subscribing on behalf of an organization. Click the pop-out icon in the upper right corner to view the newsletter full screen.